An afternoon of Jazz is being hosted by Seven Jazz and Jazz Yorkshire as part of Le Grand Depart Fringe Festival, featuring a showcase of Northern Jazz talent. 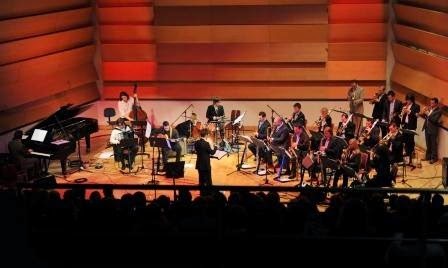 James Hamilton (Big Band) - Following on from a commission project run by Jazz Yorkshire, James Hamilton will conduct the Doncaster Jazz Orchestra through the premiere of his new work, the Yorkshire Jazz Suite. The suite is described as an hour long take on the Yorkshire landscape and people, with musical influences ranging from Duke Ellington to Kenny Wheeler. Matt Bourne (Solo Piano) - Pianist and composer Matt Bourne has won countless awards including the Perrier Jazz Award and a BBC Jazz Award for Innovation. His contribution to the UK jazz scene is almost unrivaled and his set will showcase his solo piano talents. Kim Macari (Sextet) - Since receiving a commission from Seven Jazz in 2011, Kim has gone on to win an Emerging Excellence Award in 2013, study with Ingrid Jensen and Ralph Alessi and tour her transatlantic group LOCUS. In her set, she will be joined by LOCUS bandmates Riley Stone-Lonergan, Sam Leak and special guest from NYC, Leah Gough-Cooper as well as Tom Riviere and Steve Hanley. Al Wood - Multi-instrumentalist Al Wood has had a profilic career, spending time in the Maynard Ferguson Big Band, running countless groups and working as Deputy Head of Jazz at Leeds College of Music. Tickets for the event can be booked HERE and booking is advised as it is likely to sell out.